Snaps, no. 32: Charity Bullock Edwards. Charity Edwards lived most her life in Greene County, but she married and died in Wilson County, and many of her descendants reside there now. Edwards’ parents, John Bullock and Bettie Moore, married in Wilson County in 1875 and are listed there in Saratoga township in the 1880 census. On 21 December 1899, Charity Bullock, 18, of Greene County, daughter of John and Bettie Bullock, married Stephen Edwards, 21, of Wilson County, son of Charles and Ella Edwards, in Moyeton, Stantonsburg township. Witnesses were Hattie Edwards, Con Bullock and Johny Fort of Moyeton. In the 1900 census of Speights Bridge township, Greene County: in the household of Peter Joyner, step-daughter Charity Edwards, 25, and her husband Stephen, 21, a farm laborer. In the 1910 census of Speights Bridge township, Greene County: farm laborer Stephen Edwards, 31; wife Charity, 29; and children Lonnie, 9, John H., 7, Charity, 4, William, 2, and Mary, 7 months. In the 1920 census of Speights Bridge township, Greene County: farmer Stephen Edwards, 45; wife Shady, 35; and children Louzie, 13, Willie, 11, Marie, 9, Bettie, 6, Charlie, 4, Roscoe and Oscar, 3, Ida Belle, 2, and Lucy May, 4 months, plus sister Ettie Edwards, 23. In the 1930 census of Carrs township, Greene County: farm laborer Charity Edwards, 43, widow; children Mary, 19, Bettie, 15, Charlie, 14, Lee and Sam, 13, Ida Bell, 11, Minnie, 7, Annie, 6, and Earnest, 5, and grandchildren Willie, 4, and Elmer Pender, 1. In the 1940 census of Speights Bridge township, Greene County: Agustus Speight, 27; wife Lucy Mae, 20; and children Margaret Lee, 6, Agustus Jr., 4, and Willie, 1; widowed mother-in-law Charity Edwards, 50; and siblings-in-law Minnie Gray, 19, and Annie Ruth Edwards, 16; and nieces and nephews Odell and Adell, 3, and Johnnie Edwards, 1. 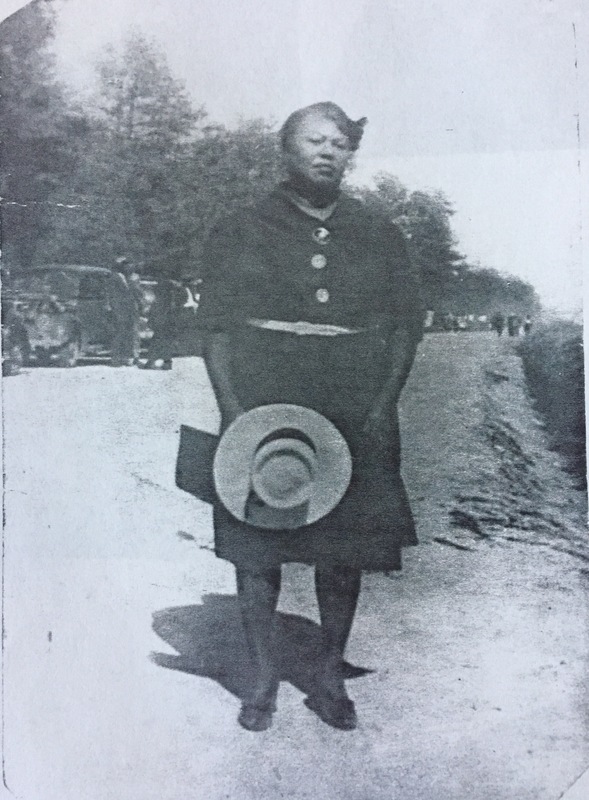 Charity Edwards died 20 December 1950 in Stantonsburg township, Wilson County. 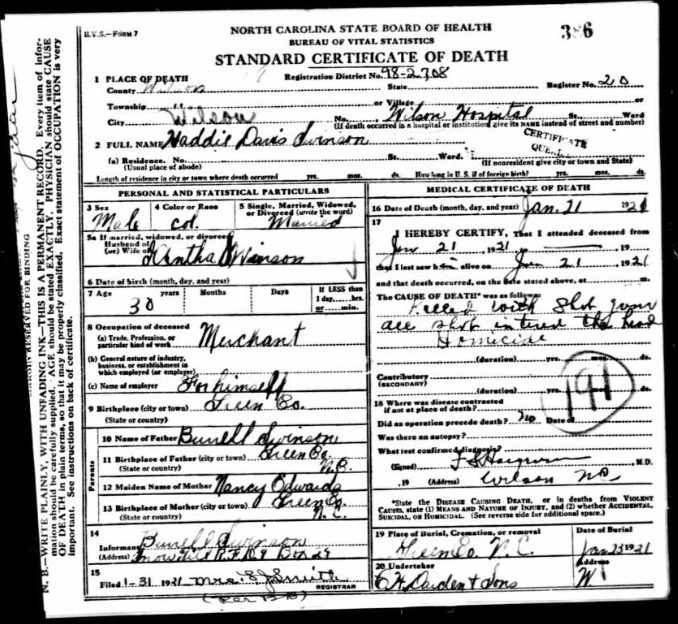 Per her death certificate, she was born in 1888 in Edgecombe County to John Bullock and Betty Moore and was widowed. Lena Dunston, Stantonsburg, was informant. Photograph courtesy of the family history booklet, Our Heritage 1812-1996: Edwards, Evans, Woodard, published in 1996 and graciously shared by B.J. Woodard. First Lieutenant Ruth C. Speight Russell, Tuskegee Army Nurse. 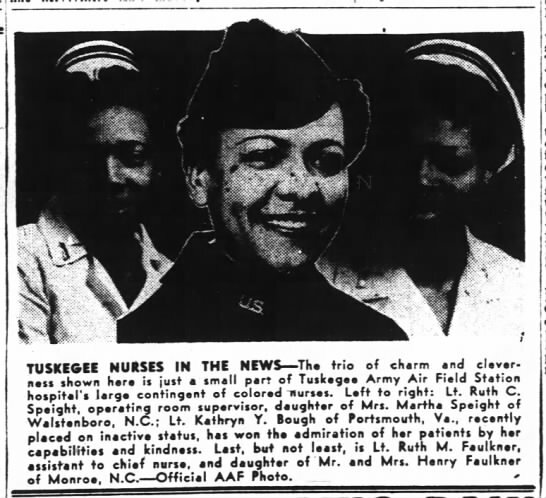 In the spring of 1942, seventeen African-American registered nurses reported to the station hospital at Tuskegee Army Air Field in Alabama to provide care for the famed Tuskegee Airmen. Ruth C. Speight, born in Wilson County, reared in Greene County, and educated at Saint Agnes Hospital in Raleigh, North Carolina, was among them. Undated issue of Pittsburgh Courier, probably early 1942. 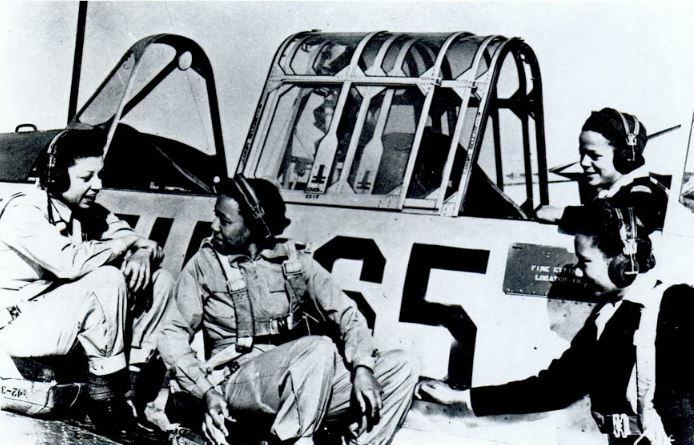 Captioned “Nurses Abbie Voorhies (Ross), Ruth Speight, Della Rainey (in cockpit) and Mencie Trotter during their flight orientation, a special part of their important duties at Tuskegee Army Air Field. U.S. Air Force Museum,” this photograph appears in Charlie and Ann Cooper’s Tuskegee’s Heroes (1996). Pittsburgh Courier, 8 July 1944. 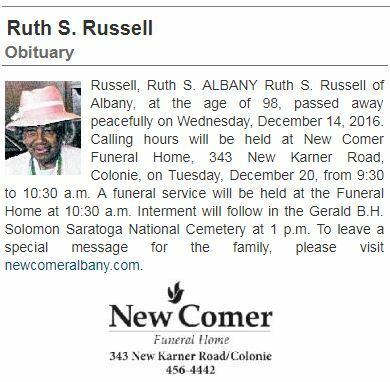 Ruth Speight Russell died 14 December 2016 in Albany, New York, at the age of 98. This simple obituary gives no hint of her extraordinary life. The Independent (Elizabeth City, N.C.), 28 January 1921. In the 1920 census of Wilson, Wilson County: on Carolina Street, laborer Haddie Swinson, 29; wife Ianthia, 31; and children May Bird, 6, Glasco, 5, and James B., 3. Haddie Davis Swinson, a merchant, was shot in the head on 21 January 1921. When Aaron Bess opened an account at the Freedmen’s Bank in New Bern, he reported that he had been born and raised in Greene County, resided at the Widow Bess’ in Greene County, and farmed for Heywood Bess. He and Evelina Bess had been married 26 years and had eleven children: Orpheus, Harper, Jane, Mary (deceased), Argent, Cherry, Alice, Nancy, Samuel Lincoln, Hattie and Hope. His parents were Abel Edwards (deceased) and Argent Edwards, who lived in Wilson County, and his siblings were Richard, Margaret, Harriet, Gracie and Justina. In the 1870 census of Wilson, Wilson County: teamster Cally Speight, wife Margaret, 26, and Ann Speight, 13, a domestic servant. Sharing their household were Abel Edwards, 84, Argen, 72, Jssie(? ), 24, a hotel chambermaid, Gracy, 23, a domestic servant, and Ann P. Edwards, 5. In the 1880 census of Moseley Hall, Lenoir County: laborer Aaron Best, 62, wife Eveline, 48, children Nancy, 18, Harriet, 12, Hopewell, 9, and Mariah, 4, and grandchildren Eugenia, 8, and Frances Joyner, 3. Freedmen’s Bank Records, 1865-1871 [database on-line], http://www.ancestry.com. Charles H. Darden, most respected. New York Age, 4 April 1931. The black high schools some places were named Carver or Douglass or Booker T.
Clara Best, born about 1813 near Stantonsburg, reported that she was reared in Greene County. Her husband Daniel Best had died the “1st spring Yankees come.” She named twelve children (plus “2 not named”) — Cynthia, William, Philip, Nancy, Ivory, Jinnie and Clara, living, and Ransom and Toney (“d. soldier”), deceased. Her father Isaac Best was dead, as was brother Nathan, but mother Sylvia seems to have been living yet, as were siblings Isaac, Rose Ann, Patience, Isaiah and David. The Ward-Applewhite-Thompson House is a historic plantation home located near Stantonsburg, Wilson County’s oldest incorporated town. It was built about 1859 and is a boxy two-story, three-bay, double-pile, Greek Revival-style frame dwelling. It has a shallow hipped roof and wrap-around Colonial Revival style porch with Doric order columns added about 1900. Attached to the rear of the house is a gable roofed one-story kitchen connected by a breezeway. “Country doctor” David G.W. Ward bought the property in 1857 and probably built the house two years later. (In the 1890s, his heirs sold it to heirs of W.H. Applewhite.) Situated on the confluence of Whiteoak and Goss Swamps, the old road to the coast (now Highway 58), and Contentnea Creek, the county’s only navigable waterway, “this well-watered, flat an fertile tract … was a prime site for the home of an important planter.” D.G.W. Ward, who was also a farmer and merchant and was active in local civic and social affairs, was such a man. Though he could hardly have worked his vast acreage otherwise, as usual, the Nomination Form glosses over Ward’s slave ownership. In a discussion of his residency, a footnote mentions that Ward is listed with 46 slaves in the 1850 Greene County slave schedule. In the 1860 census of Greene, he is credited with owning 54. Among them were Sarah Ward and her children Henry, Mittie and Appie, who were his children, too. Ward owned extensive property in both counties and likely maintained quarters in both. Certainly, his slaves labored across county lines. The Civil War set D.G.W. Ward back, but not for long. When he died in 1887, he stood possessed of more than 1900 acres in Wilson and Greene Counties. Wilson Advance, 22 August 1889. For a personal account of my history with this house, see here.